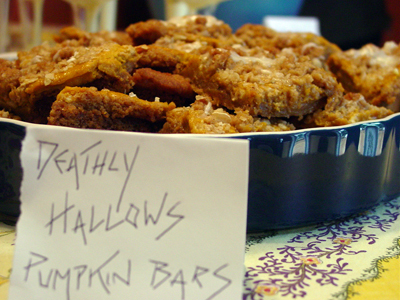 Before our Halloween/Dessert party, I asked the Daring Bakers for ideas. Peabody suggested I make Gingerbread Pumpkin Bars; she’d just made them with great success. So, I happily followed her suggestion, and she is so right: these are delicious! Spicy and sweet with added depth from the molasses, they are wonderful. The base is rich and butter, the filling moist and flavorful, while the drizzle adds just a hint of sweetness and vanilla. These are a crisp fall day packed into a tiny dessert. To make the bars, start by preheating the oven to 350-degrees F.
In a medium bowl, whisk together flour, baking soda, salt, cinnamon, ginger, nutmeg and cloves. In a large mixing bowl, beat together butter, sugar and molasses until creamy. Add dry ingredients and mix just until combined. Reserve 3/4 cup of this mixture and place in a small bowl. Scoop the remaining mixture into a 10″ x 15″ baking pan lightly coated with nonstick spray and press down to form a crust. Add the oats to the reserved mixture and mix until combined – set aside. To make the filling, beat cream cheese in a large mixing bowl until smooth. Add pumpkin, sugar, vanilla, cinnamon, ginger, nutmeg and cloves and mix until well combined. Add the eggs, one at a time, mixing just until combined. Scoop the mixture over the uncooked base and use an off-set spatula to evenly spread the mixture over the top. Crumble reserved oat mixture over filling. Bake until the topping is a golden brown, about 25-30 minutes. Remove and place on a wire rack to cool completely. To make the drizzle, in a small bowl mix together confectioners’ sugar, butter and vanilla. Mix in just enough milk until the mixture will easily flow from a spoon – drizzle over cooled bars. ← RRC #9 Round-Up, Up; RRC #10 Announced!